We headed up towards the Forge of Mount Tinang at last, pursuing Finculin, Ren the Unclean, and possibly even Sauron himself. The Numenorean siege outside had so far distracted the orcs of the mountain, but now we came under attack. We were climbing up the long winding stairs that went round and round the outside of a huge wide shaft, when we came under attack. Goblins had come out onto a walkway high above us and were firing arrows down at us. One of the arrows hit Thrandin, our elderly Diplomatic Dwarf. He was knocked off the steps into the shaft, and plummeted down out of sight! Angruin ran back down the steps after him, and bless him, Prince Irimon did the same. Everyone else went up, after the goblins. But not all of them continued to go up. As we ran down, a body fell past us. Thingolodh had fallen too. Other bodies fell after him, like a rain of goblins! I threw a rope down to Thrandin (always carry a rope!) but he heroically insisted on saving Thingolodh and sending him up the rope first. Thrandin is almost too heroic sometimes. 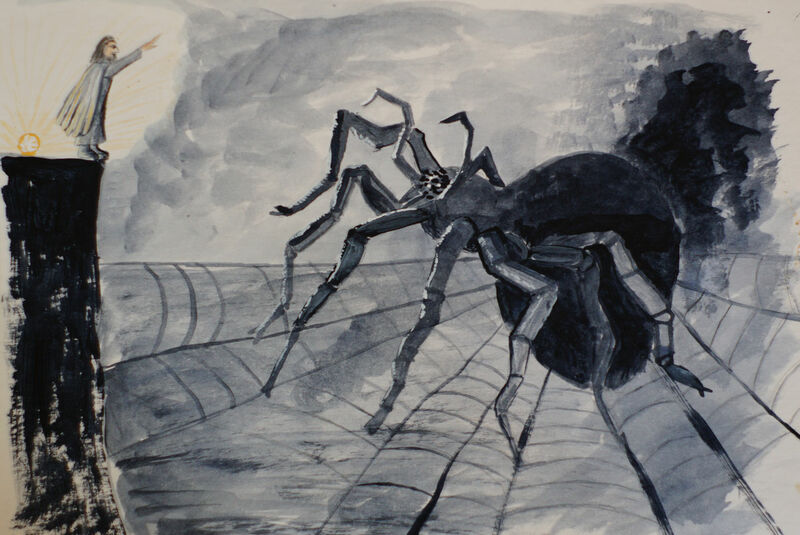 But it all worked out, because it meant that Thingolodh got to the walkway first, so when the REALLY BIG SPIDER came out, there was someone up there ready and able to hit it with a Word of Command. We climbed back up and were pleased to find that Thorofin, Ecthelion and Banik had gone through the remaining goblins like a dose of salts and the way was open into the Forge! In the Forge, we found a few nicknacks. A model dragon made of gold, marked with Finculin's maker's mark (oh dear). A wooden puzzle-box with an iron key in it. Another box with assorted gems in it (I gave them out to those who wanted them: I didn't). A copy of the Valarquenta that smelled strongly of Angband, transcribed by a Noldor thrall, annotated in Finculin's handwriting. A foot-long brass dragon automaton. A shield, made of mithril, marked with the holly-leaves of Eregion. Then we went through into the forge itself, and there was Finculin, Celebrimbor's young protégé, who I had last seen in Eregion. I thought he was dead! But here he was, quite healthy, and protesting that Sauron (Annatar) had been horribly maligned! It was quite sickening. "You are making rings for Sauron, are you serious? Didn't you SEE what he did to Celebrimbor? Your friend? "It's all lies, Sauron just wants the world to be a better place!" "No, he really doesn't, he's a horror wrapped around a nightmare!" "Yes, he really does, he's lovely really!" "HE TORTURED CELEBRIMBOR AND HUNG HIM ON A POLE! DO YOU NEED A PICTURE???" I tried getting Thrandin to talk to him, but even with Thrandin's usual level of persuasiveness, that didn't work. Finculin was still deep in Sauron's lies. There was only one thing for it: " .... Ash nazg durbatulûk, ash nazg gimbatul, ash nazg thrakatulûk, agh burzum-ishi krimpatul ..."
THAT worked. Well, sort of. The forge filled with elf-wights: captive spirits of the Gwaith-i-Mirdain that Sauron had ensorcelled, who had been tormenting Finculin! Well, at least it wasn't Sauron himself. We managed to free the wights*, and they fled to the Halls of Mandos, which was a great relief to Angruin and Finculin in particular, although nobody was particularly keen to fight elf-wights of Eregion, with the possible exception of Irimon, who was just pleased they weren't more giant spiders. Finculin was, more or less, free, although with a very troubled conscience, as he had killed his own people as he had left Eregion with Sauron. Finculin is quite young, born after the fall of Thangorodrim, to parents who had once been Caranthir's people from Thargelion. Kinslaying was not something he was used to. Also, it was not entirely clear how far he had been ensorcelled, and how far he had simply been won over by Sauron's charismatic personality. You couldn't help feeling sorry for him, but at the same time, how far he could be trusted was a bit of an awkward question. I decided I would have to be taken back to Elrond, who would, I hoped, know what to do with him. I could see Thrandin looking at us both, going 'Oh no, now there are two stray Feanorian Noldor out of Eregion to keep an eye on!' He insisted on walking next to us so he could grab us if we decided to do something unwise and Feanorian. But in fact, if anyone was about to do something unwise, it wasn't any of the Noldor. 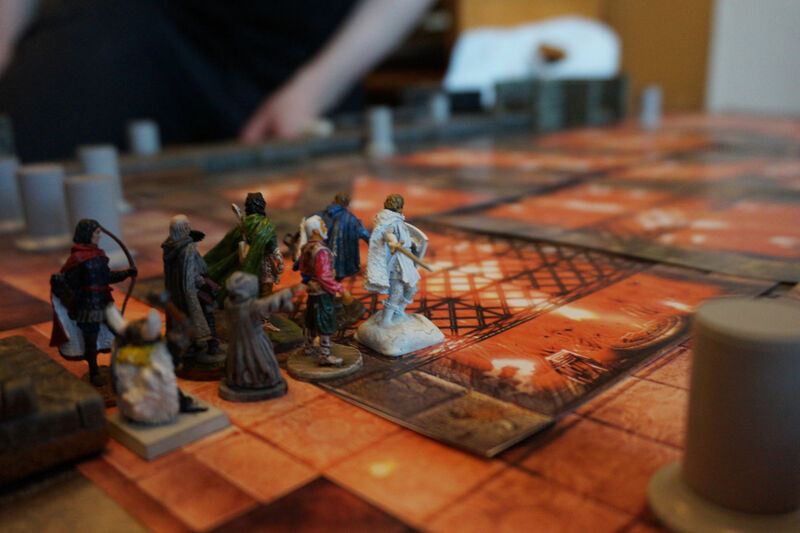 We headed up again, to the Temple marked on our map, still looking for Ren the Unclean. It was a very fiery and deeply unpleasant sort of place, and it was overrun with rats, too. 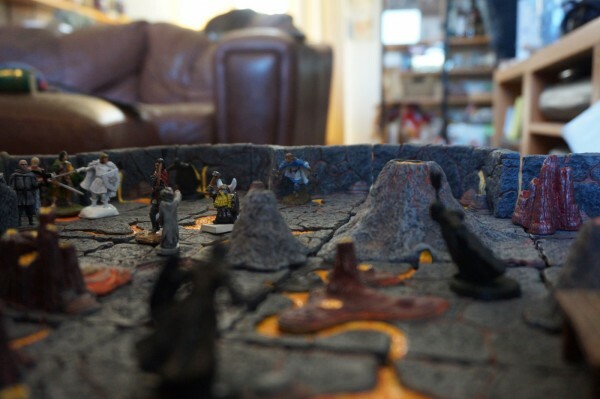 There was, thankfully, no sign of Sauron, but as we entered, we saw Ren the Unclean on the far side of the pit of fire! Irimon and his loyal knight Ecthelion rushed into battle, followed swiftly by Thorofin and Thingolodh (Thrar was still down in the library, nursing his broken legs). Ecthelion leaped on Ren the Unclean, and wrestled him to the ground. As he fell, the Ring of Power on his finger came off and fell on the floor. Prince Irimon, still adamant that he must have a Ring of Power to win the hand of the River King's Daughter, (no matter what I'd said to him! 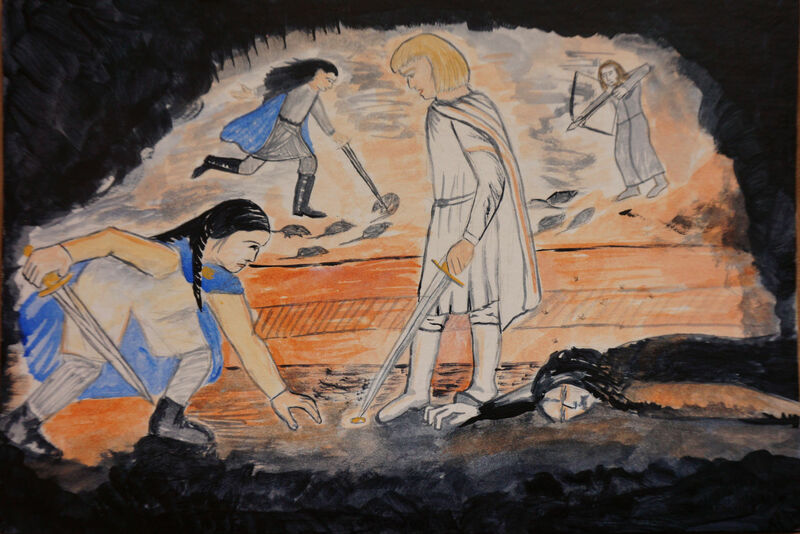 ), grabbed for it, but at the very moment that he stretched out his hand to take it, Ecthelion's sword came down through the middle of the Ring, and he flicked the Ring into the air and caught it in his own hand! And here is the last painting of the campaign. * I wish we'd thought of a clever way to do this, but I fear what actually happened was that we all got hungry and decided to just vote the wraiths banished so we could stop for dinner. Excellent final picture! (And the others, too, of course, but I'd already seen those.) I like Thorofin athletically spearing rats in the background. I think we did actually fight the wights honestly, but they proved to be surprisingly fragile and didn't last long. I think they looked grateful and thanked us as we landed the killing blow. It was the slaying of all Ren's rats and spiders that we voted to skip, partly because fondue was calling, and partly because it felt more dramatic to end with the slaying of Ren and the drama with the Ring, than to end with a bout of non-challening vermin extermination. Oh, did we? I'm relieved to hear it. My notes were a bit minimal at that point, I think I was sketching the Honking Great Spider and failing to pay attention. I REALLY want to know what Ecthelion is going to do next! And he keeps saying boring things like 'I am tired and want to play Football Manager'. You've got a lovely sense of movement in the last picture.